It’s the birth date of Christina Rossetti (1830–1894), Goblin Market, the Prince’s Progress and Other Poems; Harve Zemach (1933–1974), pseudonym for Harvey Fichstrom, husband of illustrator Margot Zemach, Duffy and the Devil; Ann Nolan Clark (1896–1995) ,The Secret of the Andes; and Rose Wilder Lane (1886–1968) daughter of Laura Ingalls Wilder and likely collaborator on the Little House books. It’s International Ninja Day. Read Blue Fingers: A Ninja’s Tale by Cheryl Aylward Whitesel, Moonshadow: Rise of the Ninja by Simon Higgins, and Blood Ninja by Nick Lake. December has been designated Read a New Book Month. I look forward to this celebration because I can present some new gems of the last couple of years. 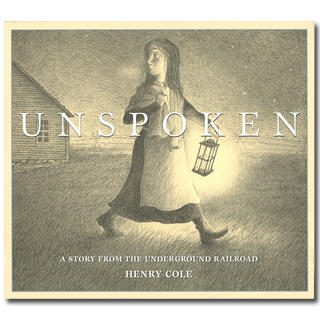 In 2012 Henry Cole published a remarkable wordless picture book, Unspoken: A Story from the Underground Railroad. In artwork created only with charcoal, paper and pencil, Henry Cole immediately draws readers into his landscape with a dramatic cover image. A young girl walks away from a house holding a lantern. Her image draws readers to turn the page and see where she is headed. At the beginning of the story a group of Confederate soldiers, identified by their flag, pass by a farmhouse as this girl watches. With her faithful cat companion, our unnamed heroine feeds the chickens and does chores around the farm. 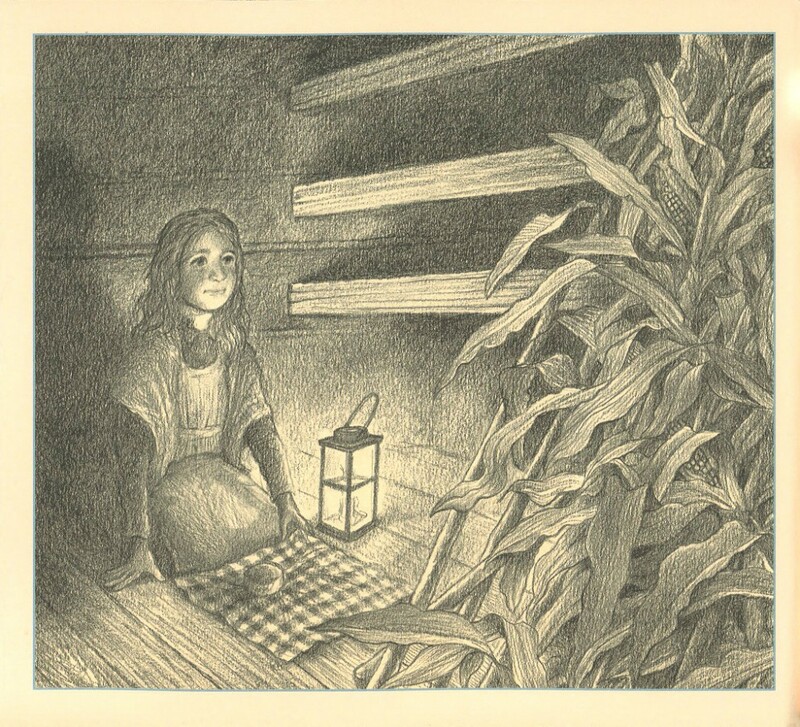 Then on one arresting page, in the middle of stalks of corn, an eye appears. Obviously shaken, the girl runs back to her house. But then, in the middle of the night, she heads back with food wrapped in a checkered cloth. She comes again and again with more offerings. The only words in the book appear when two men approach the cabin. They brandish a poster “WANTED ESCAPED! REWARD! That night, after they leave, she finds a cornhusk doll left behind for her. Like a short silent movie, the book suggests so much more than the pictures. In his author’s note Cole talks about hearing Civil War stories during his childhood when he lived on a dairy farm in Loudoun Country, Virginia, a spot close to the battles of Bull Run and Antietam. In Unspoken Cole decided he wanted to tell a different kind of Civil War story than the ones he had heard about battles—one about the quiet courage of individuals. So he developed the saga of a girl and a runaway slave who never speak but show amazing bravery. Although quilts have a strong visual prominence in the book’s art, Cole does not promulgate the “freedom quilt” myth in his author’s note. He does talk about slaves following the North Star. He has taken a serious and important subject and conveyed it simply through dramatic pictures. He trusts child readers will fill in the details. I vividly remember learning about World War II as a child, wondering what I would have done if I lived in Europe and a Jewish family had shown up at my home, seeking refuge. Unspoken allows children to ponder this kind of moral question. If you are hunting for a new book for a thoughtful young reader this year, you can do no better than to pick up Unspoken. Originally posted December 5, 2012. Updated for . It looks lovely Anita. Thanks for the suggestion. I will look for it. I finally got to look at this book just today. I absolutely love the art work. And that art tells the story completely, and conveys what can be done with images alone. This is such an amazing book and made such an impact on me. I find myself thinking about it at odd times. I think it never got the accolades that it deserved.